Potluck parties? I know, we're all scrambling to find the perfect and convenient food service provider in the metro, especially when all the other universal potluck dishes have already been picked, and you have no other choice. You have to go the extra mile to be able to bring something out of the ordinary. 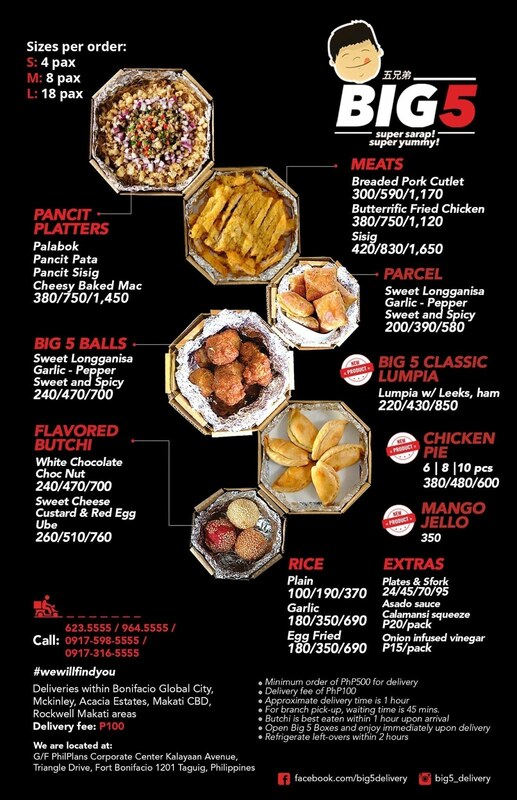 Big 5 delivery + take out is a new food service provider in the metro. It is conveniently located at BGC, for those who are interested to order food for pick up. They also deliver to several areas. Team Kaladkarin was supposed to have a little picnic around BGC, and we were supposed to order food from Big 5. But this when this didn't push through, I ordered some dishes for my family instead. 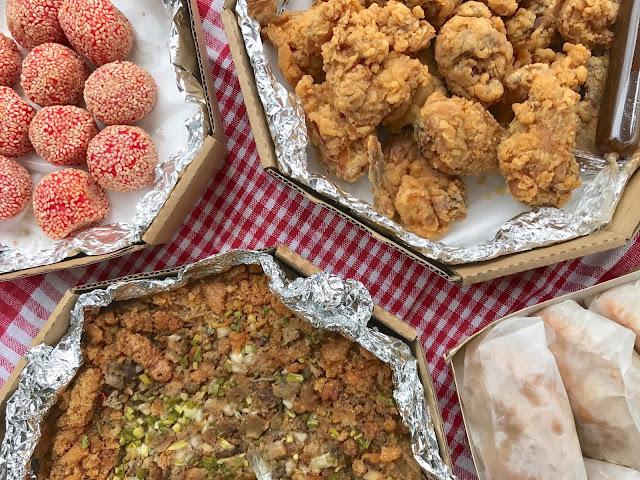 I tried the pancit sisig, butterrific fried chicken, chicken pie and custard buchi. Sisig topped pancit! I was so excited to try this one, and it certainly didn't disappoint. I had to close its container and put it far from me, as its incredibly inviting aroma was challenging me to finish the entire box. Obviously, I can't because I ordered the medium size, but I already had more than a plateful and it was hard to stop. We also loved the butteriffic fried chicken. For health reasons, I normally remove the skin of my fried chicken and give it to my sister. But in this case, I wasn't able to. I tried, but I failed. It was addicting. The chicken pie was requested by my brother. I'm no fan of pies/ empanadas, but I found this to be okay. The pie's crust wasn't soft and soggy despite sitting on the table for hours. The stuffing was also a lot. Crust to filling ratio was balanced. I initially thought that the custard and salted egg butchi was really stuffed with salted egg. It was new, it was different, which is why I decided to get one. To my dismay, it did not have the salted egg (although I think it should've had). I think they forgot to put the salted egg, or the piece I had was the only one without the salted egg. My sister liked it, though. I also got a recommendation to try their chocnut butchi (and I will). It sounds good. Overall, Big 5 Delivery + Take Out was worth the shot The easy and convenient means to order, plus the uniquely scrumptious food offerings are just two of the many reasons why this take out and delivery brand is a must try. I am surely going to bring their pancit sisig to my next gatherings. Food is one same day courier service that brings a lot of happiness along. Good to have come across this post. I shall save this post and also share it with my friends because we do have a lot of get together parties. Also, the menu seems to be perfect to me.